André Romelle Young (born February 18, 1965 in Los Angeles, California), better known by his stage name Dr. Dre, is an American record producer, rapper, actor and record executive. He is the founder and current CEO of Aftermath Entertainment and a former co-owner and artist of Death Row Records, also having produced albums for and overseeing the careers of many rappers signed to those record labels. As a producer he is credited as a key figure in the popularization of West Coast G-funk, a style of rap music characterized as synthesizer-based with slow, heavy beats.|Dr. 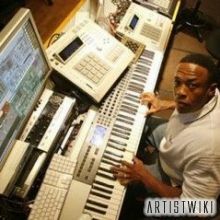 Dre began his career in music as a member of the World Class Wreckin’ Cru and he later found fame with the influential gangsta rap group N.W.A, which popularized the use of explicit lyrics in rap to detail the violence of street life. His 1992 solo debut The Chronic, released under Death Row Records, led him to become one of the best-selling American performing artists of 1993. In 1996 he left Death Row to found his own label Aftermath Entertainment, producing a compilation album, Dr. Dre Presents the Aftermath, in 1997 and releasing a solo album titled 2001 in 1999.